Yi Zuo's innovative research on the nervous system has attracted funding from three major foundations since her arrival at the University of California, Santa Cruz, in January. The Ellison Medical Foundation and the American Federation for Aging Research (AFAR) are the most recent organizations to award research grants to Zuo, an assistant professor of molecular, cell, and developmental biology. Earlier this year, she was one of three UCSC faculty members selected to receive research fellowships from the Alfred P. Sloan Foundation (see story). Zuo will receive $200,000 over four years as an Ellison Medical Foundation New Scholar in Aging, and the AFAR award will provide an additional $60,000 in funding. The grants support Zuo's research on changes in the nervous system related to aging. In particular, she is interested in the interaction between two types of cells in the nervous system: neurons and glia. Although glia outnumber neurons, scientists are only beginning to understand the roles they play in the neural circuitry. "Any information we can learn about the role of glia is very useful, because so little is known about them," Zuo said. Her lab is investigating the interaction between neurons and glia at the synapses, the specialized junctions through which neurons communicate with each other and with other cell types, such as those in muscles and glands. Structural changes and functional declines are known to occur at synapses in both normal aging and neurodegenerative diseases. Changes in the glial cells may be an important factor in age-related changes in synapses, Zuo said. The two new grants will support a research program focusing on the simplest synapse in the nervous system, the neuromuscular junction, which connects motor neurons and muscle cells. Zuo uses sophisticated microscopic imaging techniques that enable her to observe individual neuromuscular junctions in living mice repeatedly over the life span of the mouse. This technique allows the researchers in Zuo's lab to monitor the same neuromuscular synapse and its associated glia during the aging process. "We will examine the dynamic nature of the synapse and the sequence of events that lead to aging-related structural changes in neuromuscular junctions, and determine if glial changes lead to synaptic changes," Zuo said. Ultimately, the insights gained from this research could lead to the identification of glia as a novel therapeutic target in dealing with problems associated with the aging neuromuscular system. Zuo earned her B.S. 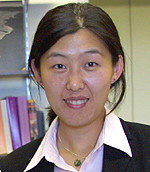 in biology at Tsinghua University in Beijing and her Ph.D. in neuroscience at Northwestern University. Before joining the UCSC faculty, she held postdoctoral positions at New York University and the University of Texas at Austin. The Ellison Medical Foundation supports basic biomedical research on aging relevant to understanding life-span development processes and age-related diseases and disabilities. The American Federation for Aging Research supports the science of healthier aging, funding research on the fundamental mechanisms of aging by providing start-up grants to scientists early in their careers. Note to reporters: You may contact Zuo at (831) 459-3812 or zuo@biology.ucsc.edu.